Amazon, which already has some of the most parent-friendly options for its Fire tablets, added some more improvements on Thursday. Why it matters: The moves come as Apple and Google are expected to invest more in this area. 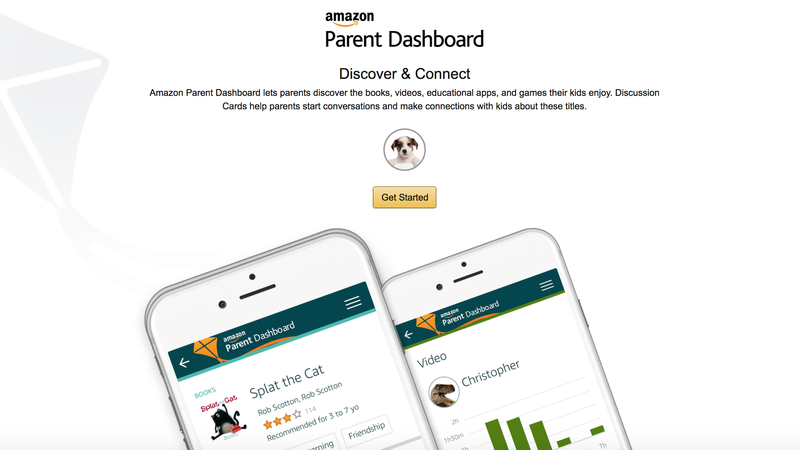 Specifically, Amazon is improving its Web-based parent dashboard that provides insights on what your children are doing on their devices. With the update, parents will now be able to remotely change the parental controls on a kids' device. The company also recently added discussion cards that provide possible conversation points related to the apps, books and videos kids are using. Survey says: The company points to a recent survey of a thousand parents that found 72% want kids to have their own tablet or smartphones and three quarters don't want to hover. At the same time, parents want to know what their kids are up to and to set limits. "We do view our role as helping parents really accomplish these goals," Amazon general manager Kurt Beidler told Axios. Beidler said Amazon's products aim to "create spaces where your kids can explore and learn independently." The backstory: Amazon already lets parents set time limits for different types of content, whitelist specific apps or videos and create kids-only environments on a shared phone or tablet. Apple, in particular, lacks such features while Google's Android relies on third party tools for such features. Earlier this year Apple added a new families page to its Web site and promised new features were coming, but declined to offer specifics. Axios also reported that additional parental controls would be coming as part of the next version of iOS even as other features get cut. Clarification: An earlier versions of this story incorrectly said that the parent dashboard as a whole was new. What's new is the ability to remotely control settings.